Halloween is upon us!! This is my favorite time of the year! I am already planning for this years party which will be my fourth one. Before I start blogging all about what I’ve been up to for it however, I wanted to go back to the beginning of my madness. 2011. My son was in 1st grade and my daughter was 10 months old. Madness took over my brain. What was the cause of this? Well… I had just discovered this new thing called Pinterest. It gave me this false sense of being able to accomplish anything. There were all these ideas just bombarding me and I needed an outlet for them! So… I decided to have a party. It will be simple I told my husband. HAHAHAHA. I started by Pinning all kinds of ideas to my brand spanking new Halloween board. That board has come a long way since then. You can find it HERE. I wanted to cram every single idea I saw into one big party. My brain was on overload! The first important detail was coordinating my costume with my daughter. I was Strawberry Shortcake and she was my little strawberry. Then it was on to the decor. I lucked out and found fabric for really cheap in a sale bin and used that as table runners. Looking back now, I’ve improved upon my tables. It drives me nuts to see that I didn’t drap the table-cloth all the way around the front of my tables. You can see I only did around the tops. Rookie mistake of course haha. I picked up the rolls of plastic tablecloth from Party City. They come in oodles of different colors and are a cheap and easy way to dress things up. I do drap it all the way to the floor in the following years parties. My husband has also improved upon his job, which is to hang the plastic from the ceiling providing the backdrop. 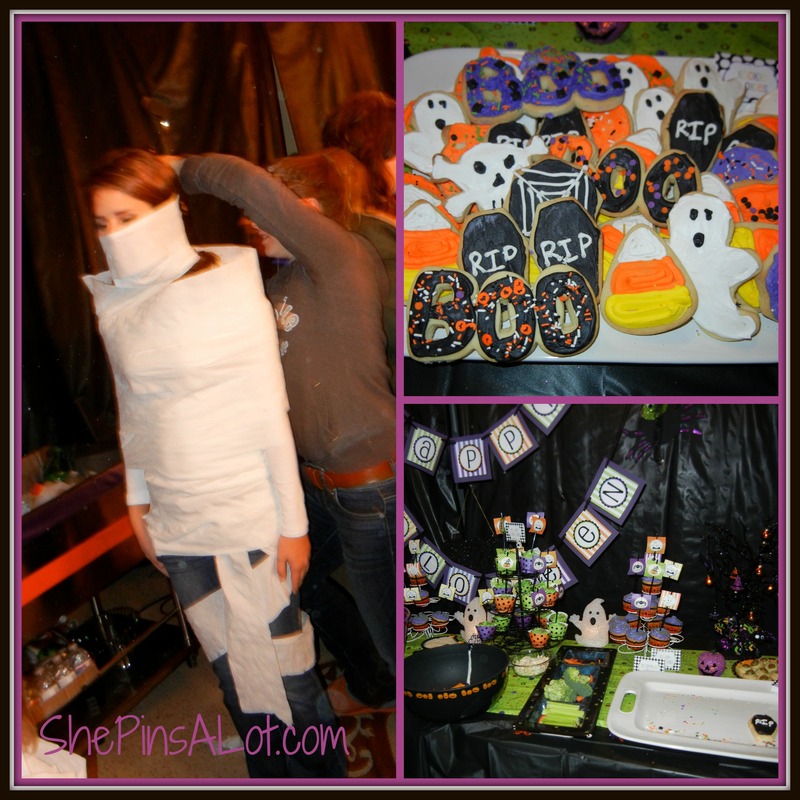 A search on Pinterest will find tons of different ways of using those rolls of plastic to decorate up your parties. Then I had all these food ideas. I had picked up several magazines from the checkout lines at the grocery store and I had made my lists of all the ideas I liked and then I wanted to do them all. I had the mad idea of feeding all these kids dinner. This year will be my fourth annual party. I’ve only done dinner at this very first one. We had over 30 kids at this first party. Last year at our 3rd party we had over 50. Did I mention I’ve only done dinner once? 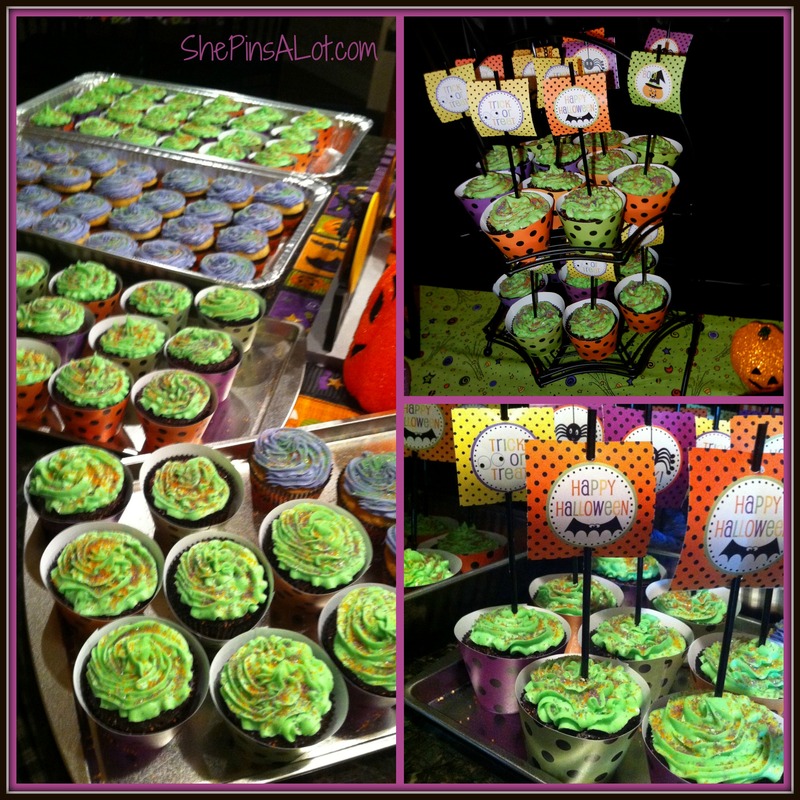 So, what do you feed 30 kids and an unknown amount of adults, and still keep it Halloween themed? I was inspired at the time by the iCarly show. There was an episode where spaghetti was served in Taco shells. 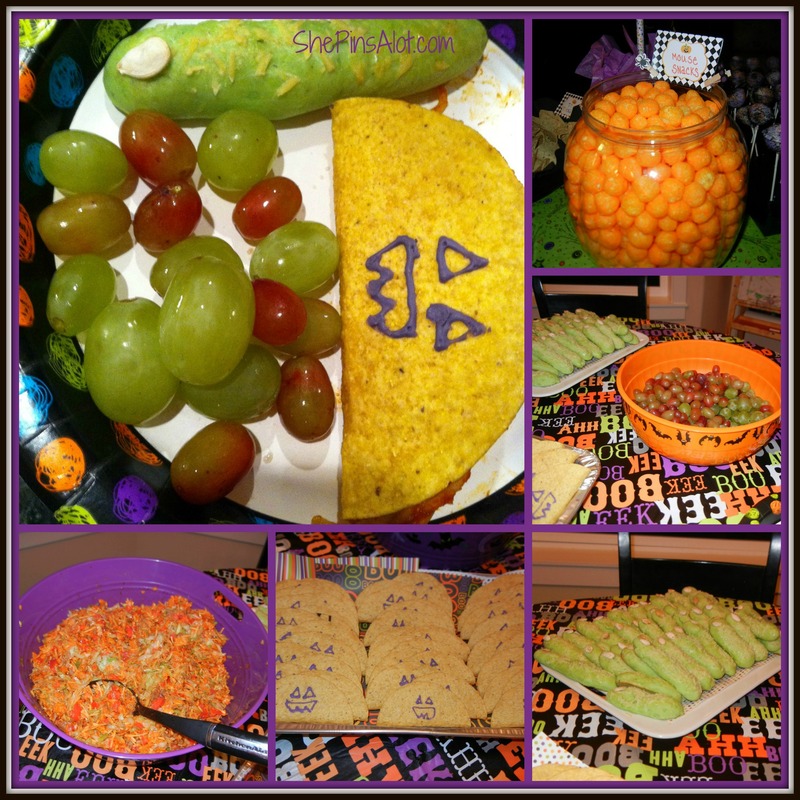 So, I drew pumpkin faces on the taco shells with purple frosting and filled them with brains, or rather with spaghetti! 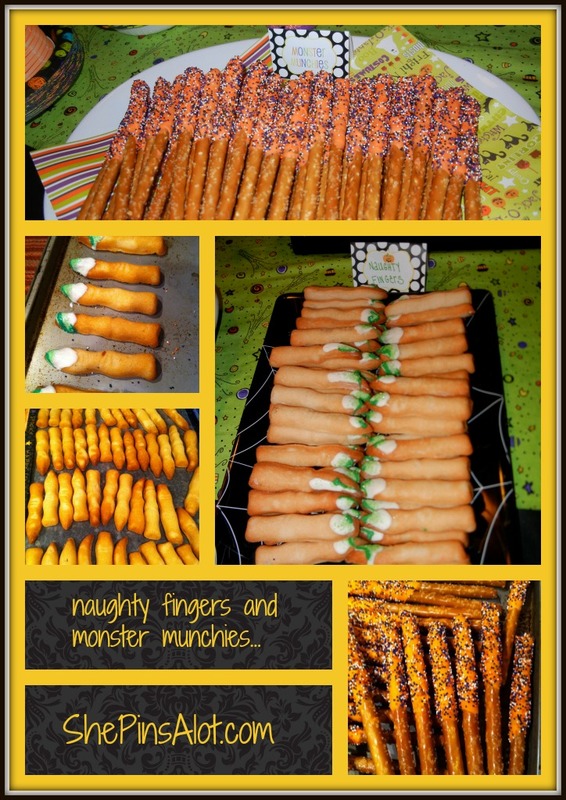 Then I went with grapes for spider eggs, and finally in my ongoing madness I made ~from scratch~ breadsticks that I dyed green and sprinkled with shaved parmesan and stuck slivered almonds at the tips and they were the hairy witch fingers. Madness. That was also one GIANT pot of spaghetti! I made the breadsticks all up early that morning and had them all on trays ready to pop in the oven just before the party. Grapes were the smartest thing as they were healthy and super duper duper duper easy! I had rented a huge ginormous tent and tables and chairs and everyone was able to sit down and eat. They did actually eat too. The spaghetti tacos were a huge hit. We made up the plates in the kitchen and I had helpers serve all the kids as they were seated. I also made up a dump truck load of taco salad for the adults. It was a cold salad that I made all the ingredients for ahead of time and just had to assemble together right before serving. Super simple and easy and very yummy. Then the very best part! What kind of deserts to make! So, back in 2011 these things called Cake Pops had just started becoming a hot new thing. Of course I had to make them! Madness took over once again and for some reason… I thought I needed to make 100 of them. I have no idea where I came up with that number but 100 sounded just about right. Madness. 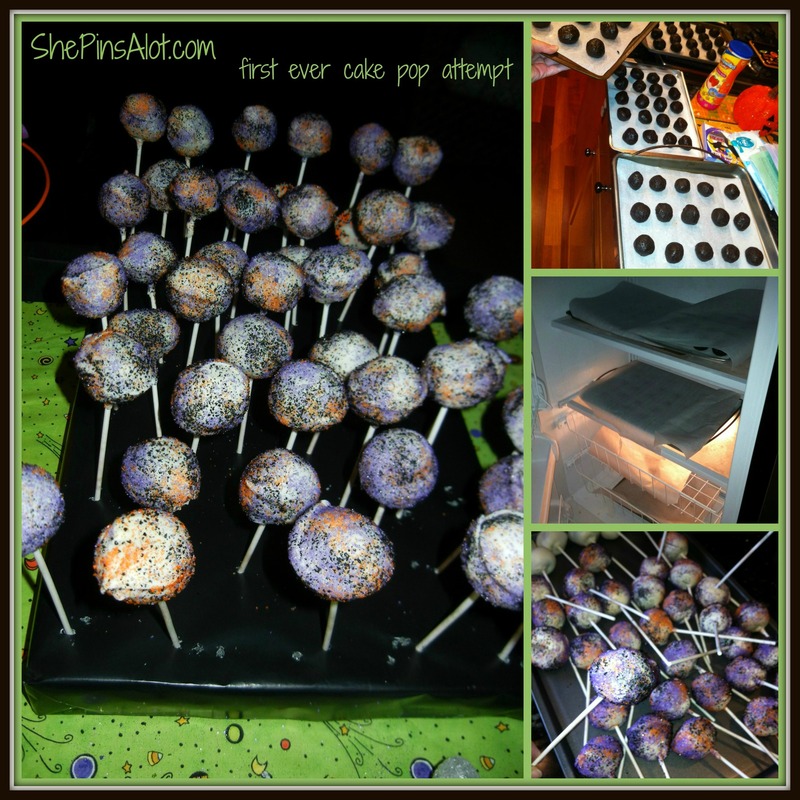 So, if you’ve never made cake pops before, don’t do 100 on your first try. If you have made them before, you’re laughing at me. Its ok, I’m laughing at myself now too. haha. I haven’t made cake pops at a party since. They are so very tasty tho. Especially these as they were made with Oreos and cream cheese and then dipped in white chocolate and then sprinkled with sugar and are like a bazillion calories each. They needed to be frozen before I could dip them in chocolate ( or sort of chilled or something ) so I had to run them across the street to my neighbor’s house who thankfully just happened to have an industrial sized freezer in their garage that was mostly empty! So, if you are about to make 100 cake pops, search your neighbors for one of those suckers! It’s probably a good thing I over made them. If they are too cold then after you dip them in the chocolate the chocolate coating will crack. I ate a lot of cracked pops that night. I think that may be how I got everything all done. Did I mention they are really good but loaded with sugar? MMMMMmmmmm cake pops. Pinterest is now chock full of all kinds of them! Next on the agenda was cupcakes. I was so excited about printables! Printables are things you can download and print out and then spend way too much time having to cut out and assemble and stick on black coffee stirrers and then shove into cupcakes. I was all about the printables. I still am, but I learned to plan ahead of time for the assemblage part. I may have been cutting them out the day of the party for this one. These are the little things that are best done weeks ahead of time when printables are super fun and a craft you can do while watching a favorite show. Not! the night before the party when you are already deep into the madness. Also, I for some reason decided that I needed to make a bajillion cupcakes to go along with the cake pops. To continue on the theme of enough sugar for an army, I made chocolate dipped pretzels and sugar cookies in finger shapes which I then made to look like boogers were hanging off them. AKA Monster munchies and Naughty fingers. There were of course one Bajillion made of all of those as well. We were well stocked for the Halloween apocalypse! These kids could have survived for months on the load of sugar I had provided! One of my favorite memories of the evening was the drink station. 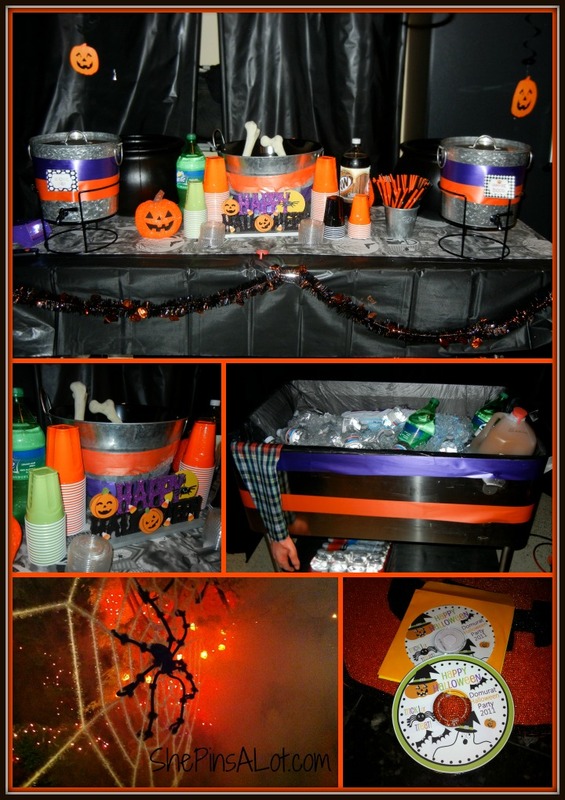 I had two black cauldrons on each side of the table that I filled with dry ice and water. All night long I was so frustrated that I couldn’t keep the dry ice fogging up. I kept going back into the kitchen every 20-30 minutes and filling up a big thing of water to come pour into each of them. Later that night my husband says to me, I can’t figure out where the water is coming from on this table, I keep mopping it all up, and then its a big mess again… about 20-30 mins later. Those black cauldrons, well they each had a little hole in the bottom of them. Oops! I discovered solo makes cups with lids!! So the kids were able to fill their glass and then have a lid on it. However with that many kids, drinks still ended up everywhere and nobody remembered what cup was theirs. Markers on the table for them to put their names on the cups is a good idea I’ve done ever since. The silver drink dispensers were from Target that year and have been one of my favorite party items ever since. I did witches brew ( apple cider ) in one and Vampires blood ( fruit punch ) in the other. The soda was too much. I’ve found that just the juice and water is plenty. Our goodie we passed out is our music CD! 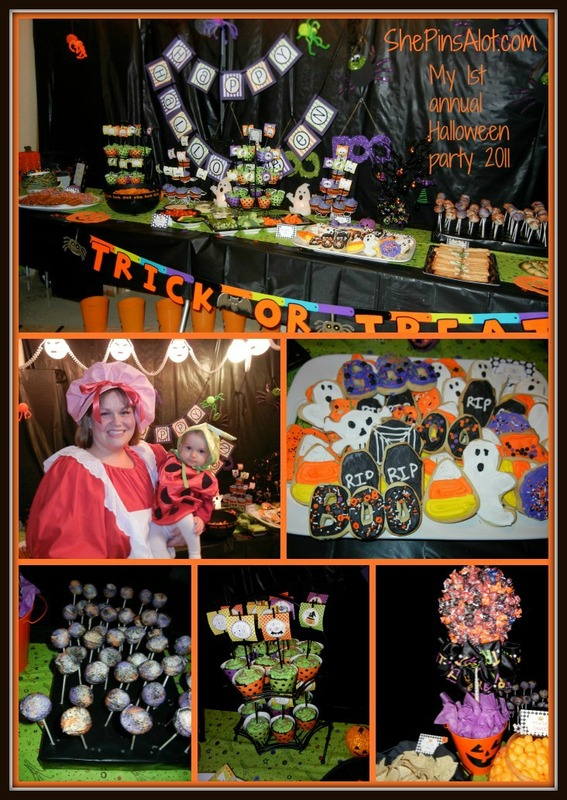 Its loaded with lots of great Halloween tunes and is the perfect thing to have the kids take home! I’ll have to come back and do a post of all the play lists we’ve now done for the past 3 years. So by that point I had over 30 kids loaded up with lots of carbs and sugar and I had to give them something to do! Time for party games! 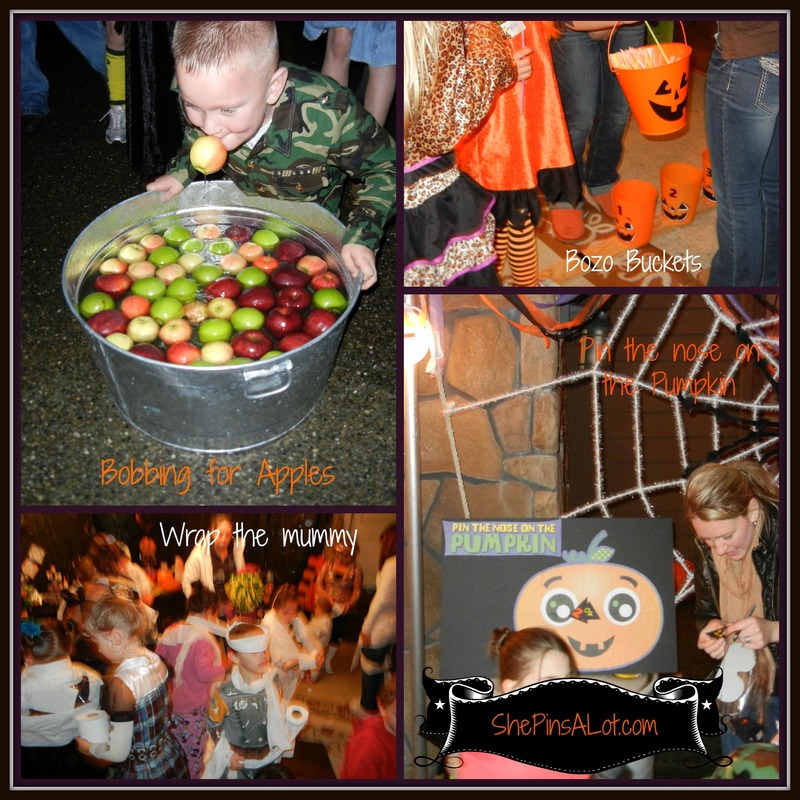 Bobbing for apples was a huge hit. The kids even ate the apples! Then I had also found Halloween themed bozo buckets at Target. We nailed them onto a piece of wood which kept them stable and easy to pull out when we were ready to play. Target also had a pin the nose on the pumpkin game which worked out great! I enlisted the help of a few of the moms and the games worked out great. Then…. the mummy game was up. It was a rainy night, so everything was a little damp. The mummy game is where you break up into teams and then wrap your partner up in toilet paper as quick as you can to make them into a mummy. This was so much fun and the kids just loved doing it. However, my driveway took a long time to recover from the bits of wet toilet paper that were ground into it. Toilet paper was EVERY WHERE after they were done. Rewards for the games were glow sticks and glow necklaces. Somehow I pulled off my first party successfully! I was very very very fortunate to have some of the best neighbors ever. Rachel and Amy in particular saved me from the madness that day. They stepped in and helped me so much that we have really bonded in friendship ever since. They have even helped again for the other Halloween parties! So they must really love me! Amy made these beautiful cookies and I’ve recruited her as the Halloween cookie diva ever since! The other smart thing I did that year was hire two babysitter girls to help out. While they did help quite a bit with my 10 month old, they did have some fun of their own as you can see them participating in the mummy game. They were worth every penny as they did all the dishes afterwards and helped with clean up. That was awesome! The table was trashed by the end of the night and everything was almost all eaten up! It was so much fun that I’m now onto my fourth Halloween party this year! I can’t wait to get to share with you 2012, 2013 and soon to be 2014’s party! 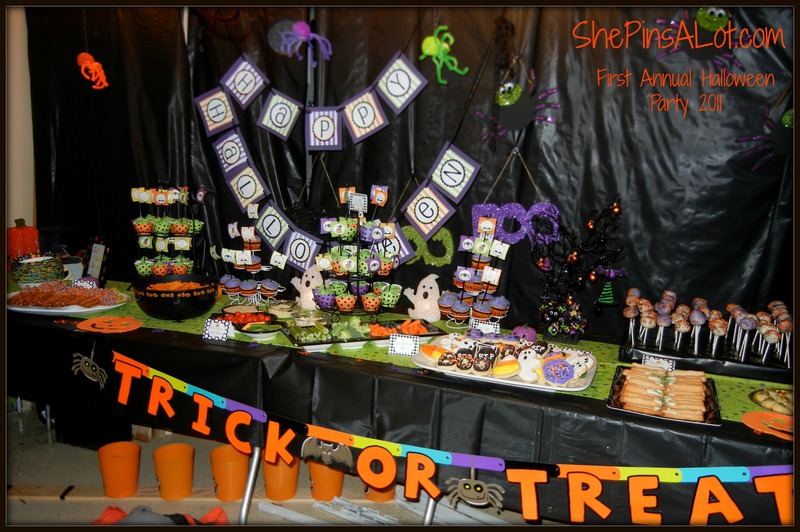 What I learned that first year is to stick to just a dessert table. Chips and dips and too many veggie tray type things aren’t necessary. Serving dinner was over kill. I still haven’t learned how to simplify, but I have toned down the madness a little! Previous postWhat is a Disney Fish Extender? You are amazing!!!! I loved the “madness taking over” comments. It’s so true! Eapecially, when I made 90 cakepops for Valentine’s Day!